Digital scope is a complex piece of equipment. 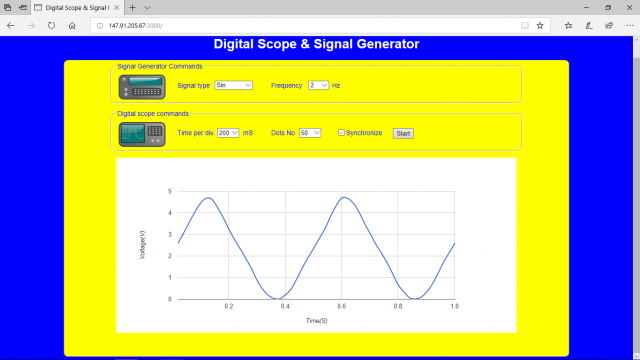 Basic functions are the display and measurements of the tested signal. This lab provides basic remote control of a simple signal generator with four types of signals Sine, Cosine, Sawtooth and Triangular signal shape with 5 selectable frequencies for the each signal. Output of the signal generator is connected to the input of a digital scope with user adjustable time base and number of dots, which are sampled values of the signal produced by the signal generator. If not synchronized, each measurement with digital scope can start at arbitrary moment, resulting with displayed measured signal starting at arbitrary value. If the synchronize box is checked, measured signal always starts at the same value. 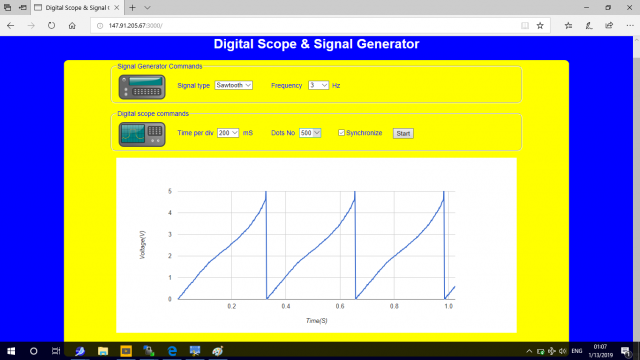 User can experiment with signal shape, frequency, time base, synchronization and how the number of dots - measured samples influences the displayed signal shape.